SecureAire’s Technical approach is based upon Active Particle Control. Active Particle Control utilizes semiconductor airborne contamination reduction technologies to monitor, optimize, and control the primary transport mechanisms of electrical space charge and airflow. We efficiently condition, collect and where appropriate INACTIVATE pathogens and particles of concern in the occupied space. Particle behavior in the very critical size range (.3 to 1 micron) of bacteria and viruses is influenced more by its electrical charge characteristics than by its particle mass. As particle size increases, typically above 3 microns in size, the electrical force influence on its behavior drops significantly. Active Particle Control makes airflow the dominant transport mechanism and controls the behavior of fine particulates by creating inelastic collisions on a sub-micron level. This causes smaller particles to collide and stay together thus becoming larger, thus providing the ability to collect the larger particles within the filter. This collision process continues into the space being treated and aids in the reduction of indoor generated contaminate levels of any type. Only SecureAire has Active Particle Control that is non-selective and has been proven to treat all indoor and outside air contaminants. Third-party testing proves that, without needing additional equipment, SecureAire’s Active Particle Control reduces viruses, bacteria, TVOCs, dissolved gasses, carbon monoxide, carbon dioxide, odors, smoke particles, diesel fumes, and jet fumes. 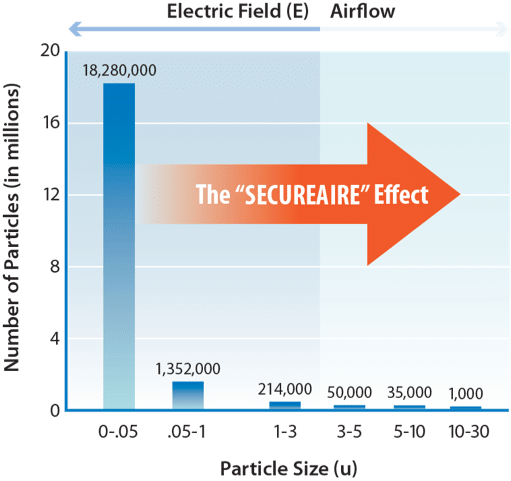 SecureAire employs electrical field control and placement techniques that convert a low particle capture efficiency filter into a high capture efficiency one, while delivering extremely low static pressure drops, long filter life and the ability to INACTIVATE airborne pathogens. Active Particle Control represents the most advanced air filtration and purification system offered today. It has the ability to be applied to a wide variety of applications previously bound by the application of standard mechanical filtration, ion generation and other electrically enhanced technologies.